Daled Amos: Why Does New York Times Compare Gaza Mall To American Malls--But Not West Bank Mall? Why Does New York Times Compare Gaza Mall To American Malls--But Not West Bank Mall? Let the message go out: We will not be defeated. True, Bronner is not referring to the New York Times, but to the Palestinian Arabs of Gaza--it just appears that he got caught up in his own enthusiasm. Actually, Bronner's enthusiasm runs throughout his article Gaza Mall Seeks to Make Statement of Resolve. It seems to dictate not only what he writes, but also what he leaves out. When Bronner writes that Gaza, famous for its misery, has a shopping mall, it is apparent that he is referring to life in Gaza--not to the misery that rockets fired from Gaza by its Hamas leaders are causing Israeli civilians in Sderot, and elsewhere. The owners of the 10-shop complex here chose the name Gaza Mall in hopes of evoking the colossal consumer complexes across the developed world. Such places stretch endlessly with brand names and multiscreen cinemas, their floors linked by escalators surrounded by two-story fountains, the variety of edibles in their food courts matched only by the seductive mix of big-box stores and boutiques. The Gaza Mall may seek to evoke such places, but it is not one of them. At 1,000 square meters, or a quarter of an acre, it is the size of a suburban residential lot in the United States and would fit in its entirety into a corner of any J. C. Penney. The stairs do not move. The piped-in music is Islamic. There are no appliances or electronics for sale, no movie screens, and exactly one fried-food restaurant. Its first floor is almost entirely taken up by a supermarket, a rarity in Gaza. “We are about the size of one medium American store,” Salahadin Abu Abdu, the mall’s manager, acknowledged a bit sheepishly. To the commentators who have never been here, certain points need to be cleared up. To those who contend the mall is proof that Gaza has construction materials: the building is 20 years old. To those who have described the mall as “gigantic” and “futuristic”: it is small and a bit old-fashioned. To Danny Ayalon, Israel’s deputy foreign minister, who wrote that the mall “would not look out of place in any capital in Europe”: it would. What Bronner neglects to mention is that the point is not that the Gaza Mall is modest by American standards--the Gaza Mall is modest by Palestinian standards as well. No mention is made of the Plaza Shopping Center in Ramallah, the West Bank’s first enclosed mall. It was built in 2004 and is 10,000 meters in size. Apparently, the Gaza Mall would fit into a corner of the Plaza Shopping Center as well. 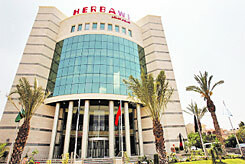 And don't forget about the Hirbawi Home Center in Jenin. It is 5 stories high and cost $5million to build. The mall was built last year, and has been so successful that besides having one in Ramallah in partial operation, there are plans to open additional malls in Hebron, Tul Karem and Nablus. The mall was built with the upper Many people in the occupied territories have money but they have nowhere to spend it if they're after quality. We offer them the best quality there is." This may not sound like the familiar description of the occupied territories - the impoverished Palestinian village or the overcrowded refugee camp, a population sustaining itself on international aid. But it turns out that quite a few Palestinians consider a plasma screen, a surround sound stereo and comfortable chairs to be fairly essential items. Here, on the fifth floor of the Jenin operation, overlooking the fields separating Israel from Jenin, are the in-demand electric gadgets: enormous TV screens, vacuum cleaners, espresso machines, and the list goes on and on. Turabi points out that some products are only available in Home Center shops. "This is an espresso machine that grinds the coffee beans," he says. "People want more and more of these products. They ask for the finest quality." Most of the products on sale are imported through the port of Ashdod. "We have exclusive deals with quite a few brands," says Turabi. "They'll only market their products at Home Center." Why does Bronner, who bewails the modesty of the Gaza Mall, make no mention of the malls in the West Bank? The answer is: the same reason that he makes no mention of the Kassam rockets still being fired at Israel from Gaza. The West Bank is not firing rockets at Israel, but Gaza is. The situation in Gaza is the result of the terrorist government of Hamas, not the defensive measures of Israel. Israel had kept those products out of Gaza for three years to pressure Hamas, the Islamist rulers here who reject Israel’s existence. Israel is not blocking select material from entering Gaza because it wants Hamas to recognize Israel--it is blocking select material that Hamas can use to fire rockets into Israeli cities and kill civilians. It is a distinction that is lost on Bronner, so while he admits that Gazan poverty is misconstrued and "is a misery of dependence, immobility and hopelessness, not of grinding want" Bronner then proclaims that "the flotilla movement is not about material aid; it is about Palestinian freedom and defiance of Israeli power." While that may explain the merely symbolic amounts of aid and expired medicine that is sent to Gaza, it is not clear that those who admit their goal is to destroy the blockade want to defy Israel so much as they want to destroy it. when a six-boat flotilla challenged the blockade, Israeli commandos stopped it and, meeting resistance, killed nine people aboard one of the ships. When a New York Times reporter agrees that breaking a legal blockade and attacking and wounding Israelis is a form of 'resistance', then I suppose what Bronner writes is all we have a right to expect. Technorati Tag: Media Bias and Gaza Mall. The shopping center in Dubai is the biggest or one of the biggest in the world. And Dubai is another Arab land. So with shopping malls functioning in Jenin, Gaza, Ramallah, Kuwait and Dubai and elsewhere, we need not feel too much remorse over Arabs deprived of this wondrous modern institution. As to whether the Gaza mall would be out of place in Europe, Bronner propagandistically answers that "it would" due its small size. But I was in Rome and Paris less than 2 months ago. And I say that it would not be out of place in those cities. Paris, by the way, tries to be an Arab capital as well as a French capital. The so-called Institut du Monde Arabe [Institute of the Arab World] takes up acres and acres of the most expensive real estate in Paris, which means some of the most expensive in the world. Is Obama More Like Netanyahu--Or Abbas? Those Aren't Self-Hating Jews--They're Oiks! Why Burn A Koran When You Can Burn A Mosque? From Reverend Wright To Imam Rauf? New Argument Against Ground Zero Mosque: Parking! "Dead Cows Float Off Lebanese Shores"
New Setbacks For Ground Zero Mosque? Syria: Clog Capital Of The Middle East!